Well, that’s a post I never thought I’d write. I’m #blessed with fingers of the sausage variety — thick, short, crooked, and topped with the kind of nails that make manicurists cry and elegant nail polish swatches impossible. Oh, and did I mention that they’re also brittle af? I figured I was doomed to a life of shapeless manicures and stubby fingers, but then I received a lovely package from imPRESS press-on nails* and it changed everything. These perfectly shaped bits of resin may not look like much, but they’re a real confidence booster. I felt like a super sassy version of myself for almost two weeks. It was glorious. And here’s the ultimate proof — I posted a close-up picture of my sausage hands on my carefully curated Instagram feed. 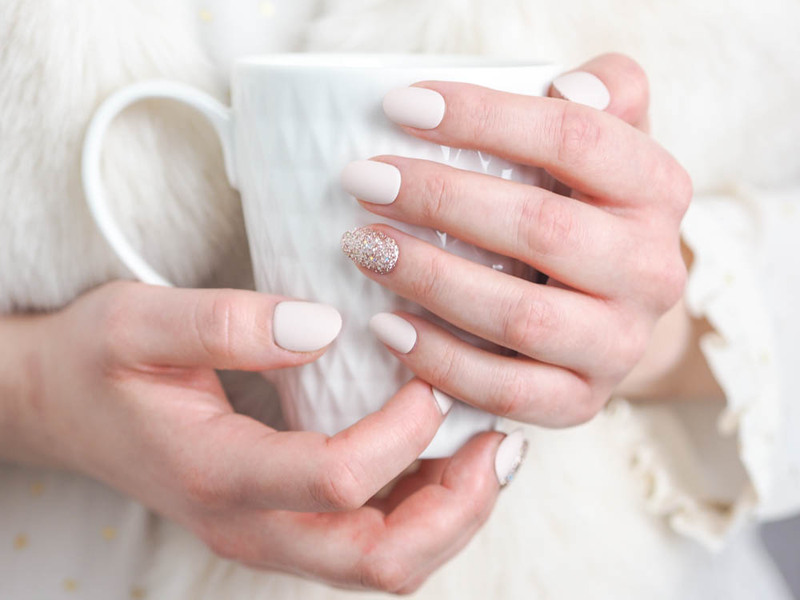 If you can’t grow your nails or if, like me, you want to elongate short stubby fingers with uneven nails, the imPRESS press-on manis are the most affordable and easiest way to experiment with fake nails. They come in a wide variety of lengths, patterns, and shapes, so you can pick whatever looks the most natural on you. I honestly didn’t think the imPRESS press-on manicures would work for me because my fingers are crooked and fake nails have never, ever worked for me before, but the almond-shaped pre-glued nails I tried were a perfect fit. I really loved Next Wave* (the blush pink set with glitter accent nails, pictured), though Symphony* wasn’t a big hit due to the square shape that doesn’t flatter my hands. My biggest worry was that I wouldn’t be able to figure out how to apply them, but I promise you, it could not be easier. The glue tabs are completely mess-free and foolproof, and I say that as someone who is more accident-prone than most. The patented SuperHold adhesive worked like a charm, but it was still easy to remove without damaging my natural nails when the time came. Once you figure out how to apply press-on nails for the first time, you’ll never want to go back to your natural nails. I was also worried that they would look obviously fake, but people were honestly shocked when I told them they weren’t all mine. The resin material is flexible and natural-looking. As long as you pick the right size for each nail and line them up with your cuticles properly (it’s easier to do than it sounds), no one will be able to tell that you haven’t grown perfectly polished claws overnight. I would also suggest going for a plain style since very graphic patterns make it a little more obvious. It’s not all sunshine and rainbows, of course. It takes a couple of days to adjust to the extra length, so things like typing, putting on tights and using touch screens can be a bit…frustrating. I was honestly surprised at how long my press-on mani lasted — almost two weeks! And I did everything I usually do, plus cleaned the whole apartment and properly scrubbed the floors (which, admittedly, I don’t do as often as I should) just to really put my new mani to the test. The only thing that I never got used to was typing. If, like me, your job is to write all day…it can be slightly problematic. It was uncomfortable to type, but not impossible! Curious? 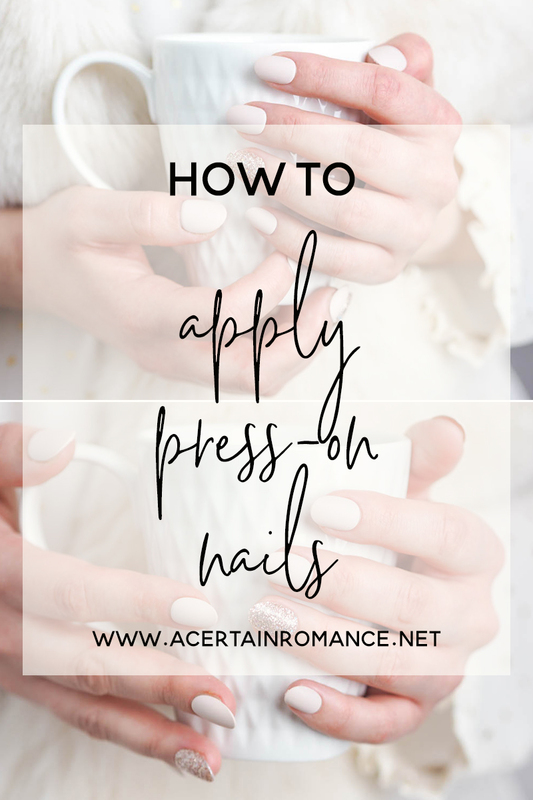 Keep reading to find out how to apply press-on nails and to read a quick press-on nails FAQ. 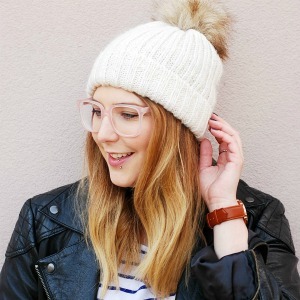 This post was written based on my experience with imPRESS, but I would imagine the process is similar no matter what the brand! Step 1. Clean and trim. Make sure your nails are nice and clean, which mostly just means free of old grubby polish. I like to file them down and shape them a little too, even though they’ll soon be covered up with shiny press-on nails. Step 2. Find your size. The imPRESS packs contain 30 resin nails of different shapes and sizes. It took me a while to figure it out, but once you find the right size, it could not be easier. Each nail is numbered, so you can make a note of which number goes on which finger for next time. If you’re between sizes, you’ll definitely want to size down to achieve a more natural look. I picked the wrong size for my middle finger the first time I tried imPRESS nails, but it was easy to remove the bigger nail and replace it with the appropriate size. Step 3. Use the Prep Pad. The prep pad is included in the kit, and it’s an important step since the alcohol helps ensure that your natural nails are free of dirt and oil. It helps the press-on nails stick to the surface of your natural nails properly, so your mani stays fresh for longer. Step 4. Align the nails. Peel off the clear plastic and align the press-on nail with your own. The clear plastic tab should be on the side of your cuticle. You’ll want to apply the thumbs last. Step 5. Apply pressure. Press down on the nail, starting in the middle and moving to the sides. Step 6. Seal your mani. 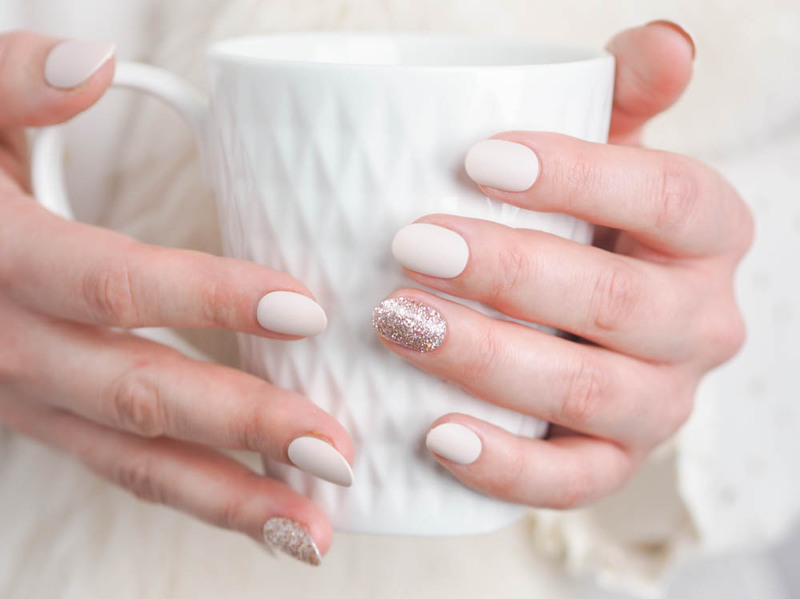 To avoid the exposed adhesive turning grubby or peeling before you’re ready to take off the press-ons, just apply a light coat of clear polish on the underside of the fake nails. Voilà! How many nails are in a pack? 30 nails. They come in 12 different sizes, so you won’t be using all of them. You won’t be able to use the same pack twice, though leftovers can make cute accent nails when paired with other colours or styles! Do I need to buy glue? No glue needed! The nails have convenient adhesive tabs. They’re a little too long, what can I do? Though I haven’t tried this myself, imPRESS says you can easily file them. Can I do everything I usually would? YES! I even cleaned the entire house. Any downsides? Typing…definitely typing…Who knew a few extra millimeters could make typing this much harder. Is it obvious that they’re fake? If you pick the right size and a plain style, no one will be able to tell the difference. I even convinced myself they were all mine at one point! How long do they last for? They lasted just short of two weeks on me. How do I remove them? You can easily peel them off by applying a little bit of nail polish remover around the edges with a cotton bud. Will they damage my natural nail? Not at all.